Cuomo & Hillary are pushing New York abortion Bill allowing abortions,by anyone, for any reason, at anytime,up to birth date, with no criminal law consequences. 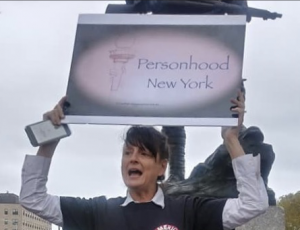 HICKSVILLE, NEW YORK, UNITED STATES, January 13, 2019 /EINPresswire.com/ — Personhood New York Condemns New York's abortion Bill #A21, same as #S240. Hillary Clinton, who in April 2016 stated that an unborn person did not have Constitutional Rights, still resides in New York. She announced last week that she will be helping Cuomo push his dream abortion Bill. He has waited many years for this Bill to get its opportunity to pass. The last election in New York State resulted in a Democrat majority in both Senate and Assembly, with which Cuomo claims will provide him with the votes he needs to receive what he has wanted for a long time. Hillary, who claims she is for women's rights, wants to strip pregnant mothers of comprehensive protections for themselves and their babies. For example, a malicious act may be performed on a pregnant woman by anyone, that would cause her to lose her baby. In the past few years, there have been cases of boyfriends slipping a pregnant woman an abortion pill so that she would lose her child, without her knowledge. The mother wanted her child, but lost it due to the malicious act. Currently there are penal laws against that act, and the boy friend could be prosecuted for an illegal abortion but those will be removed with Bill #A21/ #S240. If the Bill passes, a mother would be mourning the loss of her child with no real justice in sight. This so fiercely violates the social and human rights of pregnant women. It locks them up out of fear of enjoying life freely outdoors with full protections like the rest of Americans. Bill #A21 will allow third trimester abortions bringing with it major life threatening results to mothers. In fact, any person unlicensed or not who preforms a dangerous third trimester abortion will not and can not be prosecuted for the abortion if this bill becomes law. A former abortionist Dr. Levantino, who was a professor at Albany University stated “Long-term damage from second trimester abortion is more frequent than for abortions in the first trimester. Because the cervix has to be so widely dilated to extract the larger child, the risk of cervical damage is much greater, increasing the risk that a woman will be unable to carry a future pregnancy to term. The CDC also estimates that the risk of death increases by 38% for each additional week of gestation.” 2* Those same threats to the life of the mother increases with new threats into the third trimester. Acting in the name of Women's Rights to choose, Hillary and Cuomo are driving women off the cliff. Could it be that Cuomo and Hillary are so keen on their goal that they are entirely blinded to all the danger signs that are out there on the road? Personhood New York, together with seven different organizations from different parts of New York, are scheduled for a Press Conference at the Legislative Office Building, Albany , NY at 10:30am this Monday, January 14th, 2019. Exact location of the press conference will be on the third floor, stair side. The representatives of those organizations that will be speaking out against the bill, are the following: Catherine Donohoe, President of 'Bridge to Life'. She is also President of 'The Pregnancy Service Network of Greater New York'; Vickie Paladino, New York State Senate Candidate District 11 Queens, NY; Yonoson Tel from 'Jews For Torah Values'; Barbara From Harlem; Ayesha Kreutz, 'Founder of The Frederick Douglas Foundation of New York'; Gualberto Garcia Jones, President of Personhood Alliance, a national personhood organization, and Assembly member David DiPietro Assembly District 147.